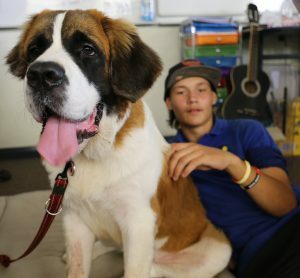 Newest member of Broome Senior High School team gives us ‘paws’ for thought. The Special Education and Needs learning area is extremely pleased to welcome Hannah the ‘assistance dog in training’ to Broome Senior High School. Hannah is a Saint Bernard, and at 6 months old is still only a puppy so, using the local provider Paws & Effect Hannah is following a comprehensive training schedule to ensure she gains all of the skills needed to become a successful assistance animal. She visits the hospital, local schools and other community organisations each week with her trainers and is learning how to cope with large crowds, socialise in different settings and respond to sounds such as school bells as well as having general obedience sessions. During her first term at the school Hannah has been gradually introduced to the students so they can get used to one another and so that the students can begin to learn Hannah’s behaviors. The pace of each session is dependent upon our student’s level of comfort with Hannah and their environment. The intention is that as Hannah progresses through her training she will become a consistent and regular presence in the classroom assisting our students as they work towards the achievement of their individual learning goals.